Söll Vi-Go, the new vertical cable system with integrated fall protection. Söll Vi-Go is a Vertical Cable System that can be retrofitted onto existing climbing devices such as ladders or rungs. It can support up to 8 workers. It is versatile and easy to use and install as there are minimal components to make up a complete system. Being that it is suited to vertical applications only, suggested industries and applications include: wind power generation, power supply, telecommunications, utilities, oil rigs, shafts and manholes. The system consists of 8mm or 10mm galvanised or stainless steel cable, ergonomic interfaces and a revolutionary guided-type fall arrestor, all manufactured from high quality materials with corrosion resistant finishes. The Söll Vi-Go shuttle has been designed to eliminate incorrect use and due to its built in energy absorbing element, impact forces on the end user in the event of a fall are reduced significantly to below 6kN. The fall arrestor is quick and easy to use as a result of its absolute single handed operation. It is also equipped with a dual locking mechanism, making it safe and preventing accidental unlocking of the unit from the cable. Söll Vi-Go is a globally approved system, that complies with AS/NZS 1891.3. Shuttles are equipped with a durable energy absorber, ensuring more safety in case of stresses acted on the rope by other users in the event of a fall. Not using a textile shock absorber considerably reduces recurring costs for damaged or old absorbers. Made of stainless steel, the shuttle is corrosion-resistant. Designed such that repairing is easy and inexpensive. Serves as cable end fixing. A unique feature of the universal clamp is that it can be fastened to pipe structures of various diameters as well as angular or flat steel profiles depending on the assembly. As an alternative to the universal clamp, the rope can directly be fastened to the rungs of a ladder. 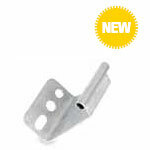 Elongated holes at varying distances provides adjustment for mounting onto various ladder sizes. Easy to install and compensates for structure movement. Available in stainless and galvanized steel. Manual bracket holds the rope into position. The rope must be released from the manual bracket before a shuttle passes through. It must be clamped back into position before getting off the system. Cost-effective, light and can be retrofitted. Holds cable to prevent excessive movement due to wind. Vi-Go shuttles can pass through automatic brackets without manual help. The bracket must be installed by passing the rope through it. Allows for quicker climbing and descending.